New City Life tells the story of the gradual development of industrial society’s essential city life to the elective city life of a leisure and consumer society. Where city life was once a necessity and taken for granted, today it is an option. For that very reason this is also the story of a transition from a time when the quality of city space did not play much of a role in its use to a new situation in which quality is a crucial parameter. Contemporary experience shows that when quality city space is provided it attracts an extensive and multifaceted city life with many new features that reflect the changes in society. 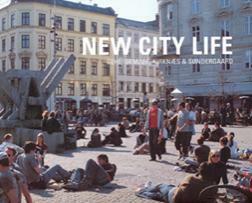 Now as before city space is the framework for people’s meetings, the society and each other. In a society where concepts such as democracy, diversity and security are important dimensions, the extended use of city space must be seen as a valuable advance. And for the same reason, modern requirements for good city space quality must be honoured. Now as before, facilitating the meeting between people is the most important collective function of the city. New city life with its demands for good city space is a new guise for one of the most important aspects of city culture. This book is based on the comprehensive and detailed study of city life in Copenhagen over the past four decades, conducted by the Center for Public Space Research at the Royal Danish Academy of Fine Arts. Jan Gehl, born in 1936. Architect, Professor at the Center for Public Space Research, School of Architecture, Royal Danish Academy of Fine Arts. Partner of Gehl Architects - Urban Quality Consultants. International teaching includes universities in Edinburgh, Vilnius, Oslo, Toronto, Calgary, Melbourne, Perth, Berkeley, San Jose, Guadalajara and Cape Town, and consultancies for London, Melbourne, Adelaide, Perth, Wellington, Riga and Amman. Jan Gehl has been awarded the “Sir Patrick Abercrombie Prize for Exemplary Contributions to Town Planning” by the International Union of Architects, as well as an honorary doctorate from Heroit-Watt University in Edinburgh. Lars Gemzøe, born in 1945. Architect, Senior Lecturer at the Center for Public Space Research, School of Architecture, Royal Danish Academy of Fine Arts. Lecturer at DIS, Denmark’s International Study Program. Associate partner of Gehl Architects - Urban Quality Consultants. Visiting professor at universities in New York, Montreal, Rouen, Hanover, Bogotà and Montevideo. Lectures at universities and conferences in Europe, North and South America, Asia and Australia. Sia Kirknæs, born in 1970. Architect, Research assistant at the Center for Public Space Research, School of Architecture, Royal Danish Academy of Fine Arts. Previous employment as Urban designer/municipal Planner for the City of Gladsaxe, Denmark. Lectures at universities and conferences in Europe, North America and Australia. Britt Sternhagen Søndergaard, born in 1967. Architect, Research assistant at the Center for Public Space Research, School of Architecture, Royal Danish Academy of Fine Arts. Previous employment as Urban designer/ municipal planner for RIA, City of Copenhagen.